After getting kicked out of boarding school, bad boy Derek Fitzpatrick has no choice but to live with his ditzy stepmother while his military dad is deployed. Things quickly go from bad to worse when he finds out she plans to move them back to her childhood home in Illinois. Derek’s counting the days before he can be on his own, and the last thing he needs is to get involved with someone else’s family drama. Ashtyn Parker knows one thing for certain--people you care about leave without a backward glance. A football scholarship would finally give her the chance to leave. So she pours everything into winning a state championship, until her boyfriend and star quarterback betrays them all by joining their rival team. Ashtyn needs a new game plan, but it requires trusting Derek—someone she barely knows, someone born to break the rules. Is she willing to put her heart on the line to try and win it all? I will say that it's definitely not for the age it's listed for. I would put this down as a new adult or more mature teen. I really didn't know what was going to happen, because I didn't (as always) read the synopsis. I just knew it's popular, I got it at BEA and everyone was going slightly crazy over it. At first I didn't want to like it, but I do. It was actually pretty good, it turned the story around a bit and I loved the change to the roles. It kinda a reminded me of a teen movie I watched in junior high school about the first female footballer. I can't wait for the next book. Anybody else love Liz?? Definitely a sleeper character, you never realize she's sneaking into the 'like pile' until the end. 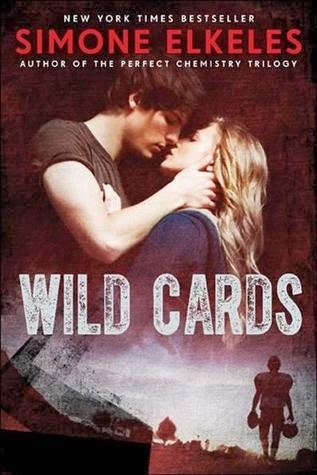 It's a fresh perspective on the typical teen romance; I even goggled the Calhoun girl to see if she was legit. I'm loving the story. I liked how they built up to their romance hell they activity fought it in both sides. But man oh man when they eventually caved?? Look out. I liked how they met, the slightly ditzy older sister/stepmother, the grouchy dad, the crazy Grandma, yeah this story had it all. I'm kinda happy Derek called out her boyfriend several times, all of which Ash was willing to ignore just so someone wouldn't leave her. Ash was complicated because she's not on the fringe like most of these young characters are, she's right in the middle of the popular and fun crowd, but her home life is sucky right now and she's struggling to keep it all together. I loved that she was a food junkie and ate crap while he dieted and ate right, but then again he's from California it's almost required to eat healthy there. The camp ground scene?? Yeah I loved the older couple who mentored to them, their story was awesome. I loved Derek's meeting with his Grandma she was very kicka**. A pretty tough cookie, a little maipulative but she had to do what was necessary. Those moments at Elite then at the party at the house made me really like Ash, she wasn't willing to take any kind of crap from Derek. Yeah they just flowed well and I found myself laughing at some points, shaking my head at others and all and all enjoying the story as I read it. I didn't want it to end and really found myself stretching the last few pages just so it wouldn't finish. I'm now adding all her books to my list. This is why my pile never really goes down as soon as I find a good story I must add everything by the author. 4 Witch Hats: Engaging Plot, Well rounded and well written characters. Great world building. It's a definite must add to your TBR Pile and a highly recommended read for the genre.